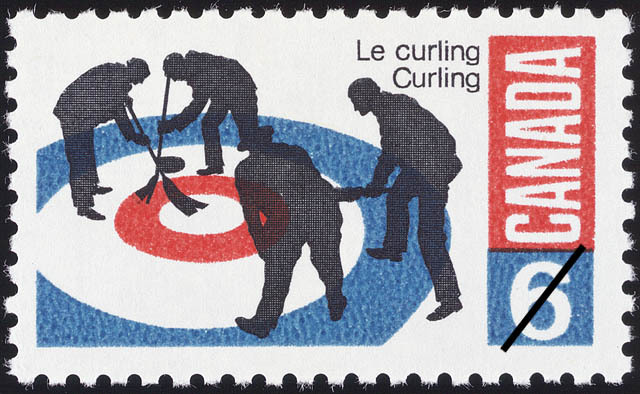 The value of a Curling - 6 cents 1969 stamp depends on several factors such as quality and wear, supply and demand, rarity, finish and more. Values in the section are based on the market, trends, auctions and recognized books, publications and catalogs. This section also includes information on errors and varieties and characteristics. Some 1,900 mens' clubs were affiliated with the Canadian Curling Association during the season 1967-68. A researcher of the history of curling can be quickly engulfed in claims and counter-claims concerning the origin of the game. Continental Europe is believed by some to be the source from whence it came, the early Icelandic "Knattleikr" also receives its share of attention as an originating contest. Some writers assert curling was introduced into Scotland from Europe during the reign of James I (1394-1437). Concrete evidence does exist that the game was in vogue in Scotland during the very early years of 16th Century; it remains, however, that in 1890 the historian of Scotland's Royal Caledonia Curling Club, with affiliated groups in twelve countries looked upon as the Mother Club, wrote: "There are no facts by which we can determine precisely the antiquity of the games". The curlers of the town of Kilsyth in Stirlingshire, Scotland, who banded together in 1716, are regarded as having the world's oldest continuing club. North America first, the Royal Montreal Curling Club, was organized in 1807; it has been established, however, that Scottish settlers curled as early as 1805 on the Mill Dam Pond at Beauport, Quebec. With a club dating from 1820, Kingston claims this distinction of being the second oldest in Canada and the first in Ontario. It was in 1882 that a report from the Organizations Ontario Branch referred to a large migration of players to the new Province of Manitoba and the North West Territories, a founding group which grew in Western Canada until, in 1925, A Winnipeg rink Journeyed to Eastern Canada for a series of games. Their visit led to establishement of the Brier, one of Canada's annual sporting classics. The popularity of the game in Canada at that time, and its impact on youth, apart from those of mature years, is clearly demonstrated by the hosts of young people in many parts of the country, who indulge in Jam-Can curling. As a do-it-yourself project, a large jam tin is filled with cement in which a suitably bent spike is inserted for a handle; the result; an acceptable inexpensive substitute with which the game can be played.